Valle Isarco on a road bike - beautiful & varied! 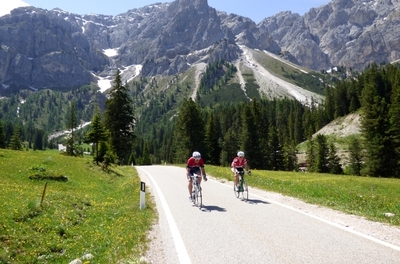 Around Bressanone, the bishops' town amidst Valle Isarco, road cyclists are spoiled for choice: cycling through Luson/Lüsen and Val di Funes/Villnöss you reach the beautifully positioned Passo delle Erbe/Würzjoch at the bottom of the majestic Sass de Putia/Peitler Kofel Mountain; cycling over Passo Giovo/Jaufenpass, you reach Merano, and cycling through Val Sarentino/Sarntal you reach Passo Pennes/Penserjoch and Vipiteno/Sterzing. Fantastic the selection, breath-taking the views!